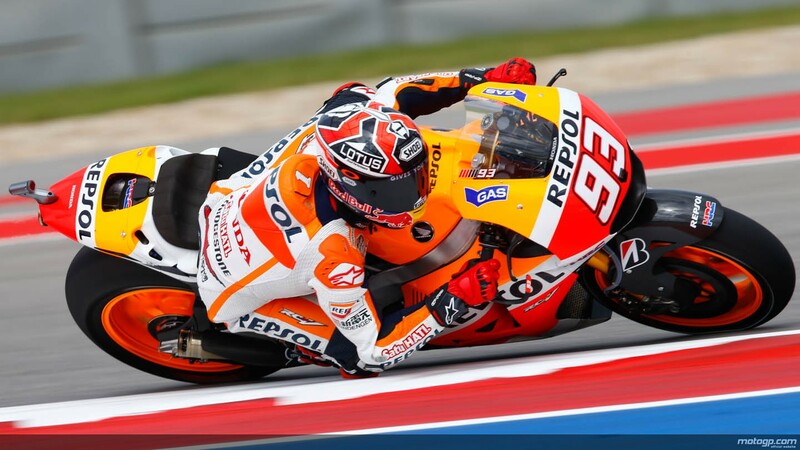 MotoGP™ World Champion Marc Marquez was fastest in both Friday free practice sessions at the Circuit of the Americas, ending FP2 a considerable 1.005s margin quicker than Andrea Dovizioso, whilst Dani Pedrosa was third best. Marquez set a best time of 2’03.490s to lead the way at the state-of-the-art track in Texas where he took his first premier class victory in 2013 and on Saturday he will be a clear favourite to repeat his pole position from last year. Indeed Marquez set his best Friday time on a hard tyre and was less than 0.5s from his own pole record set on a medium tyre 12 months ago. Ducati Team’s Dovizioso was the ‘best of the rest’ using a softer tyre, whilst Marquez led his Repsol Honda teammate Pedrosa by 1.133s. Like Dovizioso his Italian compatriot and fellow Ducati rider Andrea Iannone (Pramac Racing) made use of a soft compound to lap fourth quickest. The best of the Yamaha riders was Valentino Rossi (Movistar Yamaha MotoGP) at a circuit which he admits he found tricky last season. The nine-time World Champion trailed Marquez by 1.3s. The impressive Aleix Espargaro (NGM Forward Racing) lapped sixth quickest on the ‘Open’ Yamaha and outpaced Factory-equipped rivals Stefan Bradl (LCR Honda MotoGP) and Jorge Lorenzo (Movistar Yamaha MotoGP) in seventh and eighth respectively. Lorenzo was apparently unable to make the most of the re-introduced 2013-spec Bridgestone tyre which has been brought to this round and for which he stated a preseason preference over the 2014 version. Britons Cal Crutchlow (Ducati Team) and Bradley Smith (Monster Yamaha Tech3) rounded out the top ten behind Lorenzo.